This article is very specific and doesn't really fit into this series of general Linux tips but it covers such an annoying issue, whose solution is documented nowhere on the Internet, that I decided to include it into this Advent series. So if you're not concerned with this issue, stay tuned for tomorrow's blog post. Since Adobe has introduced Flash, there have always been major and minor problems with that on all platforms, especially on Linux. One problem I often had to deal with is a focus stealing bug with Kwin, KDE's window manager. I don't know how far this is KDE related, perhaps also some Compiz users could encounter this problem under Gnome. If you are concerned, please let me know and write a comment. To see what's going on there, you have to minimize your browser window or to hit <ALT>+<TAB>. That's very annoying and because your taskbar is always visible then, you don't even have a real full screen. But what to do? I have not figured out yet what the actual cause of this focus bug is. It might be a conflict between the browser and the Flash window, which runs in a separate process and not as a thread of the browser itself; but it could also be an issue with the compositor or something like that. Whatsoever, a way to fix this issue is to set up a window rule for the Flash full screen window. For this purpose open your system settings panel and go to “Window Behavior” → “Window Rules” and click “New”. To detect what to type in, you can click onto “Detect Window Properties” and then onto the window whose properties you need. But you might notice that this is not possible here because the full screen window closes as soon as it recognizes a focus out event, so when you click that button, Flash terminates full screen mode. But there's a little trick. Flash closes only on focus out events, but since it doesn't have the focus initially, we can do things when paying attention to not passing the focus to the Flash window in any way. So resize your browser window that it only fills part of the screen and position the properties window next to it. Arrange both windows that way that you still have some empty space on your screen. Now activate full screen, bring the properties window to the front carefully, click on “Detect Window Properties“ and then on your Flash full screen window. That's not very meaningful information but hopefully unique on your system. So tick “Match also window title” and click OK. Then enter some (hopefully more expedient) description (e.g. “Adobe Flash full screen fix”) and go to the Workarounds tab. There activate “Focus stealing prevention” and set the first drop down menu to “Force”. After clicking OK and Apply you're done. Henceforth Flash should always get the focus when switching to full screen mode. One workaround for this is that you first set a window rule for the window properties detector window. Click “New” to create a new window rule, then “Detect Window Properties” and then the “Edit Window-Specific Settings” window itself. Under “Preferences” now check “Accept focus”, set the drop-down menu to “Force” and leave the checkbox behind it unchecked. Click “OK” and “Apply”. Now Flash shouldn't close its fullscreen anymore when you click the “Detect Window Properties” button. Source: Damn Flash Player! Adobe, fix it! There have been 13 comments submitted yet. Add one as well! This problem is annoying for me too. I tried your solution but when I click on “Detect Window Properties”, the fullscreen flash background immediately disappears and the video returns to the firefox window. and select "Exact Match". Then activate "Focus stealing prevention" as described in the article and click OK, then Apply. I’ve found other way: In WindowRule settings add rule for all windows (window class and other leave empty) with Fullscreen option set to Force unmarked. Then apply all settings, try to fullscreen flash. It will have titlebar. Press right mouse button on this title bar, select advanced - special window settings. It will have all important text inputs filled. Hi Janek, Thank you for the detailed response. Even with the settings window on the second monitor, I still had the same problem. However, writing the properties manually worked!! Thanks!! Glad, I could help you. I wish you a Happy New Year! I’ve updated the article. Now you (and all the others having the same problem) should be able to use the automatic method as well. 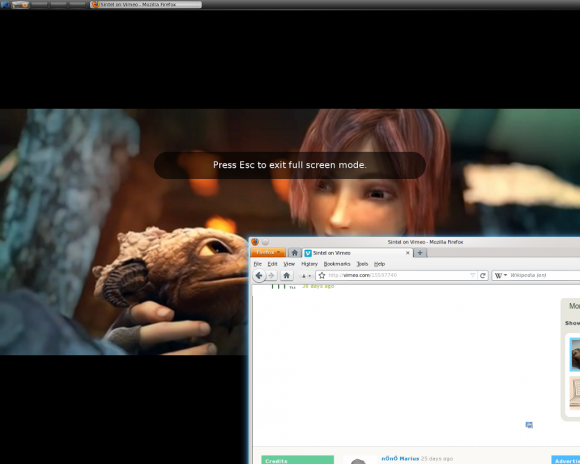 How about Fullscreen Flash on dual monitor setups. If you want to view a flash video on one screen, and want to work on the other fullscreen gets closed as you click on something. Is this doable with a kde workaround. Well, I’m also struggling with that a lot. I’ve already tried many KDE settings but without success. Also enabling separate focus for each screen doesn’t work. I guess it’s insolvable with windows workarounds. By the way, if you have active corners on your screen and one of them enables the desktop grid, be careful! If you accidentally activate the desktop grid while Flash is in fullscreen mode, you must not click the desktop with the fullscreen. If you do, KDE would not recognize any mouse or keyboard events anymore, so you have to kill KDE or reboot your computer. Instead choose another desktop first and then switch back. Perhaps I should file a bug report for that. Unfortunately, I’m not a Gnome user, so I can’t help you here. But i’m sure, you can have similar settings there. Compiz, e.g., lets you set some window rules I guess (at least with the right plugins). I recommend you play around with it. I don’t know, if Adobe will ever fix this. Flash is an extremely crappy piece of software. Thank you for your reply, I just installed gnome, using the default metacity. Not installed compiz. But did not find the gnome and the window where the rules set Find a lot of places, here is a forum to know the link. My English is not good, these are translated using google translate, please forgive me. I don’t know how to set window rules in Metacity, but you could try to implement focus stealing prevention with "wmctrl":http://en.wikipedia.org/wiki/Wmctrl. GFW very stubborn, so access to the international port will be blocked. so sorry.